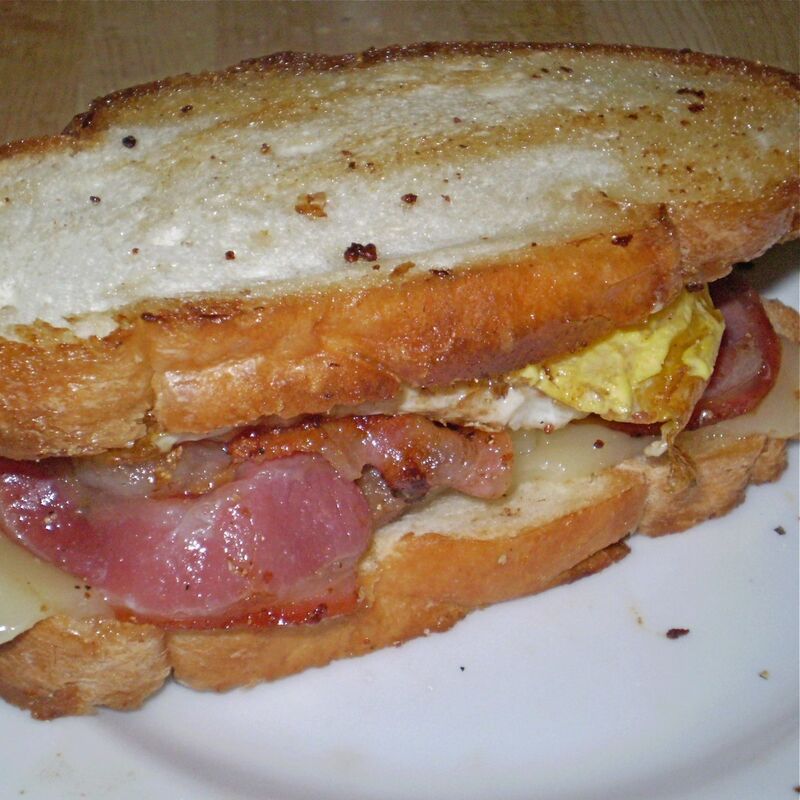 I’m out of bacon, so this morning I opened up the pancetta and made a pancetta egg sandwich on French bread. It’s lightly grilled with a slice of melty provolone inside. I started by frying two slices of pancetta in a fairly large iron skillet. When it shrank enough for me to scoot it to the side, I put a slice of French bread in the pan to toast lightly. I traded it out with the other slice of bread after a few minutes. The cheese went on the bread while it was in the pan. The pancetta came out when it was brown and crispy on both sides. It went immediately on top of the melty cheese. A dab of fresh olive oil went into the skillet and I cracked the egg into the puddle of cool oil. It bubbled and popped while the bread kept warm on the other side of the skillet. I like my egg sunny-side up, but for egg sandwiches I usually go over easy so the yolks aren’t so fragile. When the egg was nearly done, I gently broke the yolk so some of it could ooze out and cook. I made sure the center was still jiggly with a runny center when I piled the egg on top of the pancetta. It’s not on a heart healthy or low-salt diet, but every once in a while it sure is tasty! Some options that would have been good include a thin spread of mayo; avocado slices; maybe some thinly sliced sauteed mushrooms… A thin slice of a tomato fresh from the garden sprinkled with fresh graded parmesan and a splash of balsamic vinegar would also hit the spot. You could also make this with bacon, and switch out the cheese to what sounds good to you. Mmmmm. What sounds good to you? When I was a kid mom made sure we had a good breakfast every day. It might be bacon and eggs, cold cereal, oatmeal,… it was usually the second seating of whatever dad had before he went to work. The breakfast menu always included a glass of milk, orange juice, and toast and jelly. A grapefruit half or a banana was usually part of the mix. It was a pretty good routine until I got to high school. No longer was a wet comb good enough to flatten an interesting spray of bed head. It was in the days of backcombing—or ratting, as we called it—bouffants—as high as we could get them—hair-pieces if we couldn’t get them high enough, and lots of hairspray. Electric hair rollers were new on the scene. This released us from the torture of sleeping on brush rollers but it added time to the morning routine. Next add 1 egg, about a tablespoon of honey, and a splash of vanilla. Forget about the natural look! The eyes were a big deal. There was blue eyeshadow and two eyeliners, a substantial black curve next to the lashes and then a line of white above that. No smudging allowed, these were crisp sharp lines. Next came the false eyelashes. A strip of long thick spikey lashes on the top and individual lashes applied below the eyes. Needless to say, there wasn’t time for breakfast before heading off to English lit. Finally wheat germ, ground flax seed, cinnamon, and milk to the fill line. Mom reluctantly let me leave the house a couple of mornings with only a piece of toast for sustenance. When it was apparent I wasn’t going to fit breakfast into my morning routine, she went to Plan B and sent breakfast with me. She came up with this banana shake and was able to combine all the elements of a good breakfast into something I could take with me. It’s easy to whip up one of these in one of the individual serving blenders now on the market. I have a Bella I got on sale at Kohl’s. The milk goes in last so you don’t overfill the container. 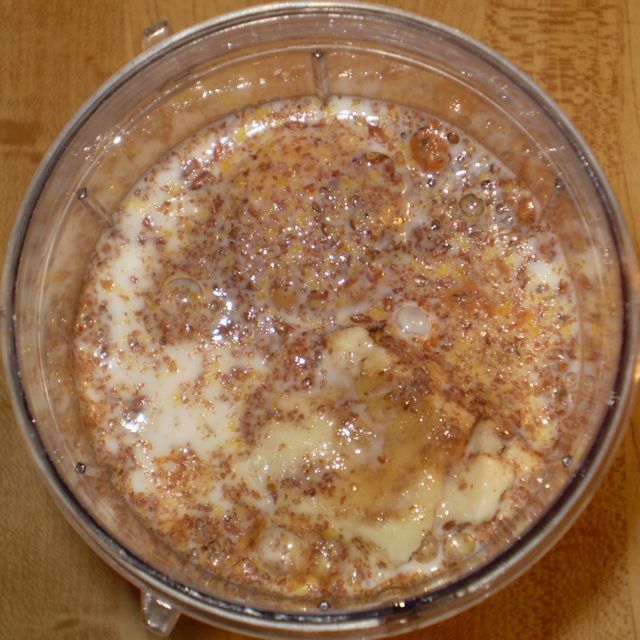 The ingredient list includes: a banana, egg, honey, vanilla, wheat germ, ground flax seed, cinnamon, and milk. 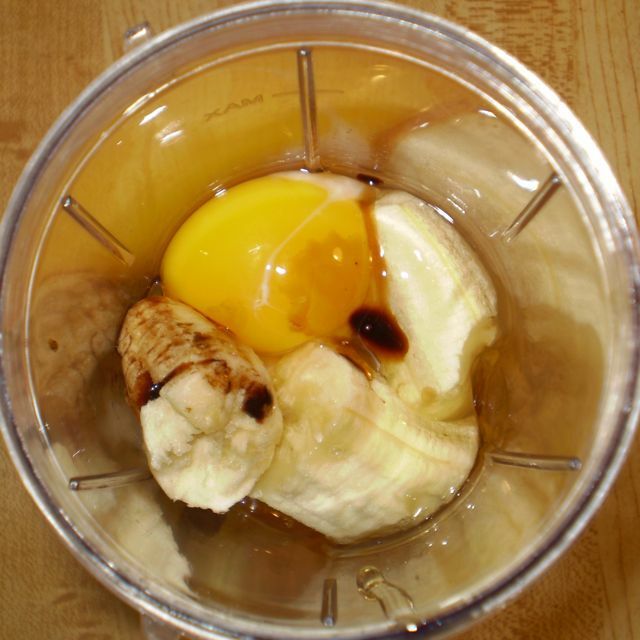 Blend the shake and let it settle before blending again. This will break up any chunks that may have evaded the blade the first time. 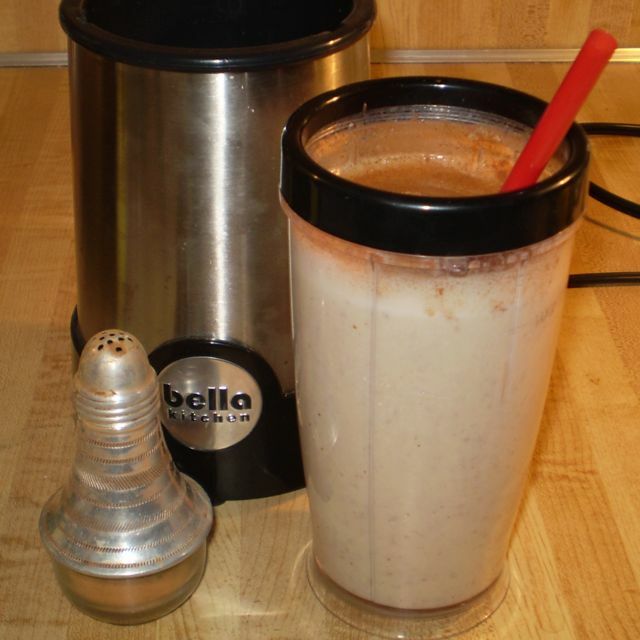 Ground cinnamon in a shaker makes it easy to add a healthy garnish to the shake. I know there is a concern that raw eggs may be contaminated with salmonella. Here’s a link to CDC information about the risks eating of contaminated raw eggs and how it happens. You can leave it out if it makes you nervous. 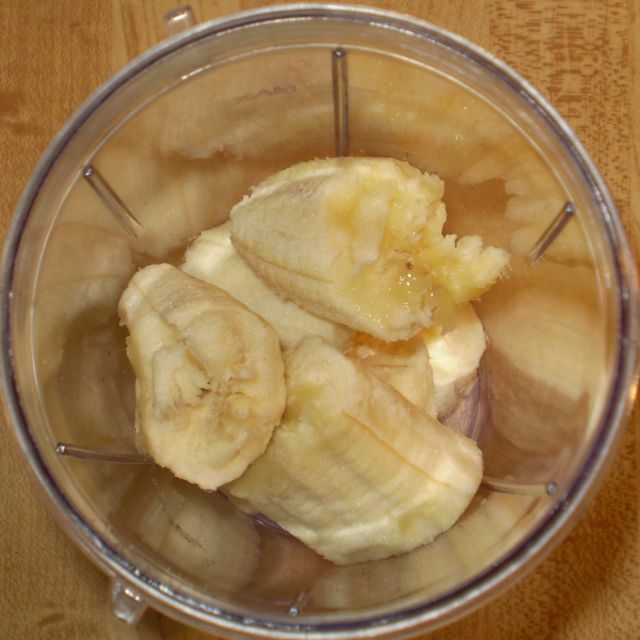 Here is the nutritional data for the Basic Banana Shake as I usually make it. It’s more calories and not as healthy as it could be. If I use skim milk, and Greek yogurt instead of the egg I could keep the protein, reduce the fat and it would probably be just as larrupin.